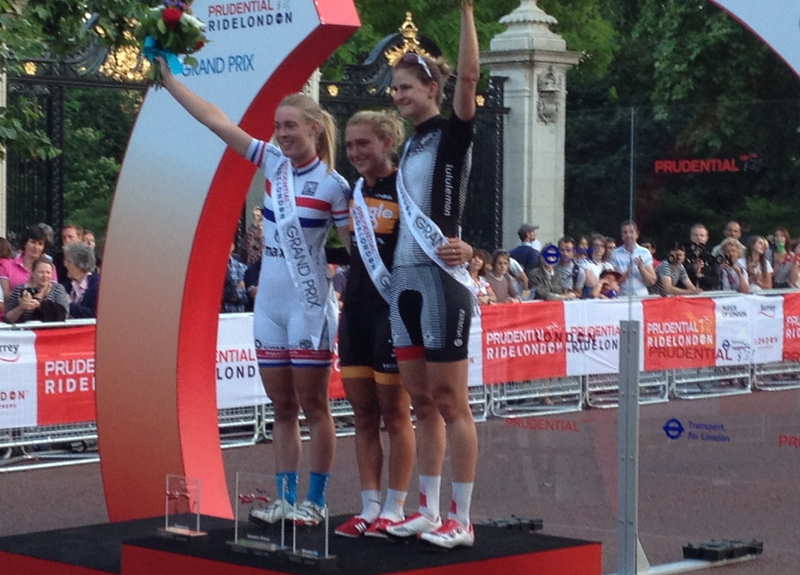 Double Olympic champion Laura Trott thrilled the crowds on The Mall this evening as she sprinted to win the inaugural Prudential RideLondon Grand Prix. Trott (Wiggle-Honda) timed her sprint to perfection to beat current National Circuit Race Champion Hannah Barnes (MG-Maxifuel) in a repeat of their controversial clash at the IG London Nocturne in June. However, this duel was was much easier to call, as Trott comfortably crossed the line first, even though Barnes visibly closed in on her in the final 50 metres. Specialized-Lululemon’s Loren Rowney took third. Speaking about her victory, Trott said: “It’s absolutely amazing. I’ve been working so hard for this event; I felt like it was my event as I’m an ambassador for for Prudential. “I was so motivated to do a good job. It was a year to this day that we qualified for the final [in the team pursuit at London 2012], so to be out here with Dani [King] and Jo [Rowsell] was amazing. Trott then told Cycling Weekly that she was off to a “pasta party” after the race, as she prepares to ride a quarter of the RideLondon 100 mass-participation event tomorrow. Not such good news for Wiggle was that Joanna Rowsell crashed on the last lap and was taken to hospital. A member of the team’s staff told CW that the British time trial champion is believed to have broken her collarbone in the fall. “It really hurts me. She doesn’t even actually like the road that much so that’s sad. She’s such a great racer,” Trott said of her team-mate. Despite missing out on the victory, 20-year-old Barnes admitted she was pleased to finish on the podium, saying:”Second’s the first loser, isn’t it? No, no, I’m delighted with it, considering the people in the race. Everybody thought I’d come second anyway, and it was a bit messy at the finish, I got a bit boxed in. Rowney was equally as diplomatic, and was happy to finish third given that her and British team-mate Katie Colclough were outnumbered by both Trott and Barnes’s teams. “I would have like to have won, but Wiggle were so organised, and I had just one other team-mate. Third is great, but you always want to come away with the win,” she said.